What is difference between smog and fog? ‘That may seem like a question that doesn’t really need to be asked. Surely, everyone already knows the answer. Air pollution is, well, wait now . . . OK, what is air pollution, exactly? Ask most people “what is air pollution?” and they will answer “smog” (another word for ground-level ozone), the smelly stuff that turns the air brown or grey and hovers over urban centers like Los Angeles, Mexico City and Beijing. But air pollution comes in many forms, and may include a number of different pollutants and toxins in various combinations. The two most widespread types of air pollution are the aforementioned ozone (smog) and particle pollution (soot), but air pollution also may include serious pollutants such as carbon monoxide, lead, nitrogen dioxide and sulfur dioxide, and toxins such as mercury, arsenic, benzene, formaldehyde and acid gases. The specific composition of air pollution in a particular location depends primarily on the source, or sources, of the pollution. Automobile exhaust, coal-fired power plants, industrial factories and other pollution sources all spew different types of pollutants and toxins into the air. Smog is grimy and dirty. Smelly and foul. It is smog, and it is more dangerous than it seems. 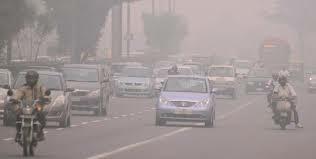 Smog is a combination word derived from ‘smoke’ and ‘fog’. However, smog is much more that that. One of the primary components of smog is ground-level ozone. While ozone in the stratosphere protects life on Earth from excess harmful UV radiation, ozone on the ground is hazardous. Photochemical smog (or just smog for short) is a term used to describe air pollution that is a result of the interaction of sunlight with certain chemicals in the atmosphere. Ground-level ozone is formed when vehicle emissions containing nitrogen oxides (primarily from vehicle exhaust) and volatile organic compounds (from paints, solvents, and fuel evaporation) interact in the presence of sunlight. The excess amount of ozone that forms can lead to Alert Days issued for public heath. In addition, numerous medical conditions, such as asthma, are exacerbated by smog. What we typically call smog today is a mixture of air pollutants—nitrogen oxides and volatile organic compounds—that combine with sunlight to form ozone. Ozone can be beneficial or harmful, good or bad, depending on its location. Ozone in the stratosphere, high above the Earth, acts as a barrier that protects human health and the environment from excessive amounts of solar radiation. On the other hand, ground-level ozone, trapped near the ground by heat inversions or other weather conditions, is what causes the respiratory distress and burning eyes associated with smog. Smog is produced by a set of complex photochemical reactions involving volatile organic compounds (VOCs), nitrogen oxides and sunlight, which form ground-level ozone. Smog-forming pollutants come from many sources such as automobile exhaust, power plants, factories and many consumer products, including paint, hairspray, charcoal starter fluid, chemical solvents, and even plastic popcorn packaging. In typical urban areas, at least half of the smog precursors come from cars, buses, trucks, and boats. Major smog occurrences often are linked to heavy motor vehicle traffic, high temperatures, sunshine, and calm winds. Weather and geography affect the location and severity of smog. Because temperature regulates the length of time it takes for smog to form, smog can occur more quickly and be more severe on a hot, sunny day. When temperature inversions occur (that is, when warm air stays near the ground instead of rising) and the wind is calm, smog may remain trapped over a city for days. As traffic and other sources add more pollutants to the air, the smog gets worse. Ironically, smog is often more severe farther away from the sources of pollution, because the chemical reactions that cause smog take place in the atmosphere while pollutants are drifting on the wind. What are the Effects of Smog? Smog is made up of a combination of air pollutants that can compromise human health, harm the environment, and even cause property damage. Smog can cause or aggravate health problems such as asthma, emphysema, chronic bronchitis and other respiratory problems as well as eye irritation and reduced resistance to colds and lung infections. The ozone in smog also inhibits plant growth and can cause widespread damage to crops and forests. Who is Most at Risk from Smog? Children—Active children run the highest risks from exposure to smog. Children spend a lot of time playing outside, especially during summer vacation from school when smog is most likely to be a problem. As a group, children are also more prone to asthma—the most common chronic disease for children—and other respiratory ailments than adults. Adults who are active outdoors—Healthy adults of any age who exercise or work outdoors are considered at higher risk from smog than people who spend more time indoors, because they have a higher level of exposure. People with respiratory diseases—There is no medical evidence that the ozone in smog causes asthma or other chronic respiratory diseases, but people who live with such diseases are more sensitive and vulnerable to the effects of ozone. Typically, they will experience adverse effects sooner and at lower levels of exposure than those who are less sensitive. People with unusual susceptibility to ozone—Some otherwise healthy people are simply more sensitive to ozone and other pollutants in smog than other people, and may experience more adverse health effects from exposure to smog than the average person. Elderly people are often warned to stay indoors on heavy smog days. According to the most recent medical evidence, elderly people are not at increased risk of adverse health effects from smog because of their age. Like any other adults, however, elderly people will be at higher risk from exposure to smog if they suffer from respiratory diseases, are active outdoors, or are unusually susceptible to ozone. How Can You Recognize or Detect Smog Where You Live? Generally speaking, you will know smog when you see it. Smog is a visible form of air pollution that often appears as a thick haze. Look toward the horizon during daylight hours, and you can see how much smog is in the air. In addition, most cities now measure the concentration of pollutants in the air and provide public reports—often published in newspapers and broadcast on local radio and television stations—when smog reaches potentially unsafe levels. The U.S. Environmental Protection Agency (EPA) has developed the Air Quality Index (AQI) (formerly known as the Pollutant Standards Index) for reporting concentrations of ground-level ozone and other common air pollutants. Air quality is measured by a nationwide monitoring system that records concentrations of ground-level ozone and several other air pollutants at more than a thousand locations across the United States. The EPA then interprets that data according to the standard AQI index, which ranges from zero to 500. The higher the AQI value for a specific pollutant, the greater the danger to public health and the environment. Particulate matter (PM) – These tiny particles of soot, ash, liquids cause a smoky haze in the air and contribute to heart disease and respiratory illnesses. Potentially more damaging than large particles are the fine particles of 2.5 micrometers or smaller that can be inhaled deep into the lungs. Particulate matter is considered one of six criteria pollutants under the National Ambient Air Quality Standards (NAAQS), as mandated by the Clean Air Act. Sulfur oxides (SOx) – Sulfur dioxide (SO2) is among the oxides of sulfur linked with asthma and other respiratory illnesses. SOx are considered one of six criteria pollutants under the National Ambient Air Quality Standards (NAAQS), as mandated by the Clean Air Act. Nitrogen oxides (NOx) – Nitrogen dioxide (NO2) is one of the oxides of nitrogen linked with elevated levels of asthma, emphysema, bronchitis, and heart disease. NOx are considered one of six criteria pollutants under the National Ambient Air Quality Standards (NAAQS), as mandated by the Clean Air Act. Lead (Pb) – Lead contributes to neurological (brain) and renal (kidney) disorders. Lead is considered one of six criteria pollutants under the National Ambient Air Quality Standards (NAAQS), as mandated by the Clean Air Act. Mercury (Hg) – Elemental mercury released in coal combustion can convert to a variety of hazardous mercury compounds and species. Mercury in various forms contributes to neurological (brain) disorders in developing children and adults. Because coal-fired boilers emit 48 tons of mercury annually in the U.S., the EPA has proposed pollutant standards for power plants. Do you think that anybody can damage your soul? Then why are you so embarrassed? I laugh at those who think they can damage me. They do not know who I am. They do not know what I think. and with which I live. In three words I can sum up everythings. I ‘ve learned about life. Why they have pale faces? Try to focus, is it my world? Courage unless you’re scared before you do it. Don’t wait until people are dead to give them flowers. Don’t let your pride or lack of courage stand in the way of saying you’re sorry. It doesn’t take strength to hold a grudge; it takes strength to let go of one. I’ve been trying to find the word that says what I need to be in life. “Brave’ is the only word. It’s the only thing that I ask myself to be. who’s struggling, who’s frustrated,unsatisfied, barely getting by. But that feeling’s a lie. We need someone to remind us that it won’t always be this way. The person who loves you more will fight with you daily without any reason. But whenever you’re sad that person will fight with the world to end your sadness.